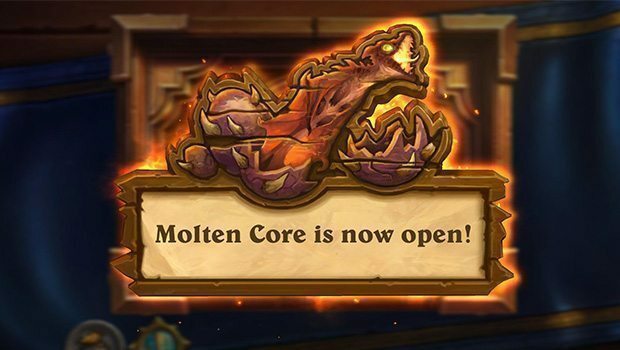 Molten Core, the second wing of Blackrock Mountain, opened up earlier this week. Intrepid adventurers will be facing Garr, Baron Geddon, Majordomo Executus, and Ragnaros. Things are starting to …heat up here. Remember those Grim Patrons you picked up in the last wing during Blackrock Depths? They’re going to come in handy against Garr. There’s a fully developed board for Garr with nothing but Firesworns on that side. When they die, the Firesworn deals 1 damage to you for each Firesworn that died this turn. Oh yes, and Garr’s hero power is Magma Pulse. Oh to top it off, Garr summons 3 additional Firesworns if the ones on the board are gone. If you don’t want to try to rock it out with the warrior, I’d recommend playing a priest deck instead. Your key component cards here are Circle of Healing and Mass Dispel. Try to start with a Circle of Healing in your hand as it’ll buy you some much needed time. His hero power does 1 damage to everything on the board. With his Firesworns in play, he can’t put out any minions of his own as long as you can keep them alive. If you can draw into a Northshire Cleric, it’ll fill your hand instantly. You might end up milling yourself out of a few cards but the only damage you’ll take is from Garr’s hero power. In fact, the deck I used last week on heroic Emperor Thaurissan might do the job with a few modifications. Keep focusing on beefing up one minion and hit it with an Inner Fire for the massive damage. Don’t worry about going after the Firesworns. They won’t do any damage on their own unless they die or unless Garr buffs it with a Mark of the Wild. That can be remedied with a quick Silence. When you hit heroic, the same strategy should apply. The difference is that he has a higher life total. Druid of the Flame will become available to you once Garr is defeated. The flexibility offered by being able to convert the Druid of the Flame into a beefy 2/5 minion or a glass cannon of a 5/2 minion may seem appealing at first, but outside of those effects, this particular druid is going to be largely useless in comparison to other cards with similar mana costs. None of the major druid deck archtypes would want to run this card in the main deck. Baron’s hero power forces you to use your mana quickly and efficiently or else you’ll take heavy damage from Ignite Mana. A warlock deck powered by Mal’Ganis will be of tremendous help. Cards that offer you spare parts can assist in counteracting Baron’s hero power by using them as filler spells if you can’t quite finish emptying your mana completely. Living Bomb will ensure that your minions either need to die or you and everything else on the board that belongs to you will assuredly die since it’s 5 damage to them. Thankfully, you’re playing a warlock and the general attitude of warlocks is to sacrifice all the things! Sacrificial Pact, Void Terror, and Siphon Soul give you options to counteract Living Bomb. Mal’Ganis is included as a stop gap in the event Baron’s hero power does get activated towards the late game. Lifetapping with your Floating Watcher in play will allow you to gradually raise it’s attack and health. Mistress of Pain will help provided additional sources of health gain if you need it. This is one of the tougher heroic bosses since he comes with 50 health and 50 armor. The heroic version of Living Bomb will smoke anything on your half of the board with 10 damage on the subsequent turn. Keep controlling the board and minimizing damage you take from Baron’s hero power and use the same strategy in the normal version of the encounter. Baron’s award is Blackwing Technician. This card is a little useless right now since the rest of the cards that would really synergize with this won’t be available until the rest of the wings have been unlocked. The last boss of the Molten Core wing is Majordomo. His hero power? It’s called “The Majordomo” which summons a 1/3 Acolyte on normal. Once you manage to defeat Majordomo, the game isn’t over. Ragnaros will be summoned and immediately take his place. Ragnaros has 8 health and 8 armor so you need to get in 16 points of damage. On normal mode, I ended up using a variation of a druid deck that eventually overpowered all of Majordomo’s minions and kept his side of the board to a minimum. Strong taunts from Druid of the Claw and Sludge Belchers will help ensure that those acolytes don’t end up doing anything. Continue developing your side of the board. Keep Majordomo at around 20 health (and shredding whatever armor he has up). A well-timed Savage Roar and Force of Nature combined with the existing minions should be enough to kill both Majordomo and Ragnaros on the same turn. The heroic version of Majordomo and Executus is even worse. Majordomos hero power now summons acolytes who are 3/3. Ragnaros now spawns with 30 health and 30 armor. His hero power strikes two targets simultaneously. There’s an interesting bug going around where if you use one of the warlock spells on Majordomo, it doesn’t cause Ragnaros to spawn. I suspect that will get fixed fairly shortly. The approach for Majordomo is going to be similar to the one used earlier for heroic Garr. Survive the onslaught of minions and build a minion with enough punch that can take down Ragnaros in the same turn that Majordomo gets eliminated. Majordomo has a ton of Molten Giants lying around and you don’t want to allow any of them to come out. That means dropping Majordomos initial health down to 21 or so and then holding it there. Use your Power Word: Shield, Divine Spirits, and Temple Enforcers to build up the health of a minion. Velen’s Chosen and well timed Dark Cultists can help with this. Kel’Thuzad will be useful in that he can revive dead minions on your side of the board to combat Majordomo’s hero power and any addition minions that he summons. Deathlords can assist you in holding out. Defeating Majordomo Executus and Ragnaros will yield the Majordomo Executus legendary card which has a rather interesting Deathrattle effect that turns you into Ragnaros with 8 health and a hero power that randomly deals 8 damage to an enemy target. I would not recommend using him in a competitive deck. I’ve encountered opponents who dropped Majordomo only for me to quickly kill him and then overwhelm my opponent’s health down to 0. If you missed out on my attempts, you can catch the full livestream on our Twitch channel or on YouTube!